I’m Ronaldo. Barry Ronaldo. Cristiano Ronaldo’s identical twin brother. Since everybody always thinks I’m him, sometimes Cristiano lets me take his place so he can have a break from his crazy life. You probably think that sounds like fun, but it’s not because everything always goes wrong for me. For example, I recently mistook a tube of hemorrhoid cream for toothpaste and just this morning I forgot my online banking password as well as the answers to all my security questions for it. Cristiano wanted to celebrate Real Madrid’s Champions League title by quietly doing charity work all around the world, so he told me to play in Euro 2016 in his place. I reminded him that it never goes well when I do this and that I’m nowhere near as good at football as he is, but I accidentally ended our Facetime session and dropped my phone in a bowl of soup that wasn’t even mine so I couldn’t call him back. I told myself to just relax and enjoy the experience. That the hours I put in teaching myself not to vomit when more than 12 people are looking at me at the same time would pay off. But then I couldn’t score against Iceland in the first match and that completely destroyed my already fragile confidence. After the match, I felt uncomfortable in front of the press, so I tried to lighten the mood by saying, “I thought they’d won the Euros the way they celebrated at the end, it was unbelievable. When they don’t try to play and just defend, defend, defend this in my opinion shows a small mentality and they are not going to do anything in the competition.” Because obviously Iceland is a small nation and obviously it was a big moment for them to get a point from their first ever Euro match, but no one picked up on my sarcasm and every journalist on the planet wrote about what a mean jerkface Cristiano is for saying such a thing, not know that it was really me, Barry Ronaldo. So that made everything worse and I slept in the bathtub that night as a punishment for myself. The next couple days were kind of a blur. I screamed every time Pepe came near me. I’m pretty sure Nani stole all my socks. And I had an ingrown toenail that really hurt a lot. 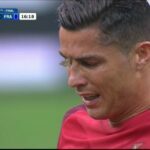 I was hoping that I could make things right for Cristiano in the match against Austria, but that didn’t happen at all. I missed a bunch of scoring chances again, including a penalty that would’ve won the match, because my toe still hurt and sleeping in the tub messed up my back, and everyone was looking at me, and Pepe was standing behind me so I couldn’t see what he was doing. But I didn’t vomit, so I keep trying to tell myself that it could’ve been worse even though I am crying so much that I have dehydrated myself. Basically, this tournament is a never-ending nightmare for me. I just want to go home. I don’t like football. French food gives me gas. And my nephew, Cristiano Jr., said “You’re the worst, Uncle Barry” — which really doesn’t feel good. I bought a new phone just so I could text Cristiano to come to France and fix this horrible mess I’ve made before it’s too late, but he’s probably visiting people in a hospital somewhere and those places always have terrible phone reception so I don’t know if he will make it in time and now I’ve dropped this phone in someone else’s soup, as well. Why are people always eating soup everywhere?! In conclusion, please don’t be angry with Cristiano for what I, Barry Ronaldo, have done. I’m sorry for everything. And if you have any extra socks, I would really appreciate it if you could send them to Cristiano/me because the thought of confronting Nani makes me extremely uncomfortable. Thank you.